We were happy it was raining when we woke up so we didn’t have to feel guilty about not using the tent. The rain didn’t last for long and we packed up and headed off for breakfast and a visit to Al and Dominique’s home up the road. We didn’t leave Richmond until 10am with the knowledge it was only 45kmish to New Norfolk. And what a fantastic 45 kilometres it was! We almost forgot Tasmania had hills as we sped over Middle Tea Tree towards Brighton, then down to Bridgewater and up the eastern side of the Derwent River towards Boyer. There were some ‘undulations’ of course, but generally the ride felt fast and fun. The hardest part was rolling down to the caravan park in New Norfolk then back up into town to get some food! 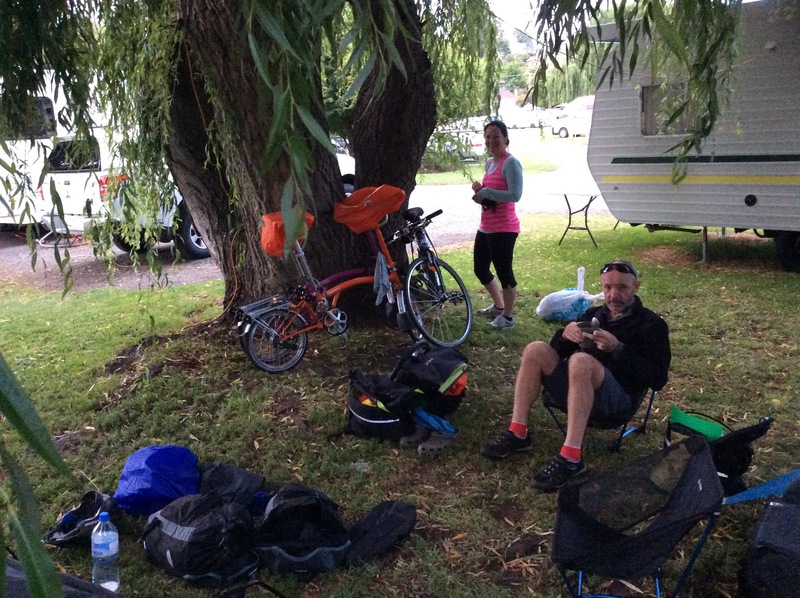 We met up with Naomi, a long time friend of ours who was out on her second ever bicycle touring trip, and had organised to spend the night with us at the caravan park. 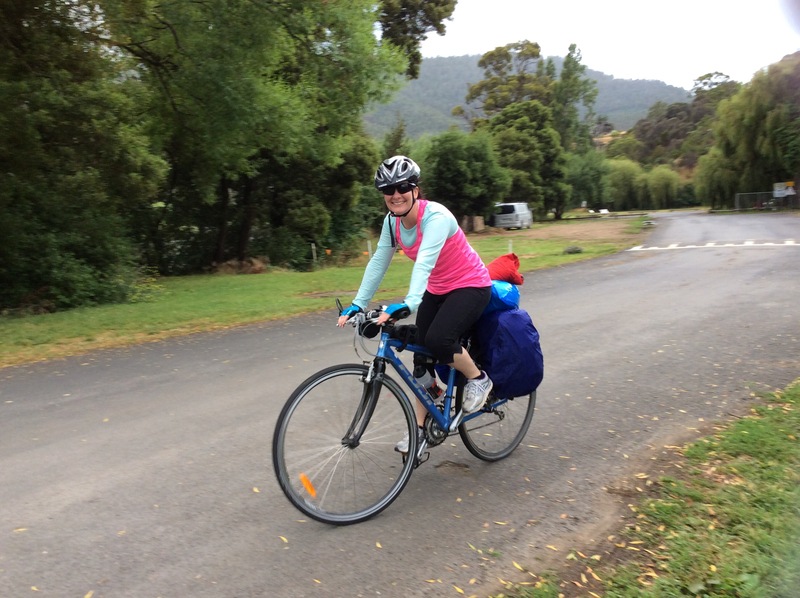 Naomi had ridden from Kingston to Mt Field and camped overnight (in the rain!) then returned to New Norfolk for the night. New Norfolk caravan park is in a lovely location near the river. Our site was right next to the office van and the toilets, which meant we heard lots of loud conversations and weird characters walking past during the night…apart from that it was great. We spent the afternoon chatting underneath our weeping willow and catching up on old times. Tomorrow we would ride to Hobart, then the ‘cycle tour’ part of our holiday would be over! 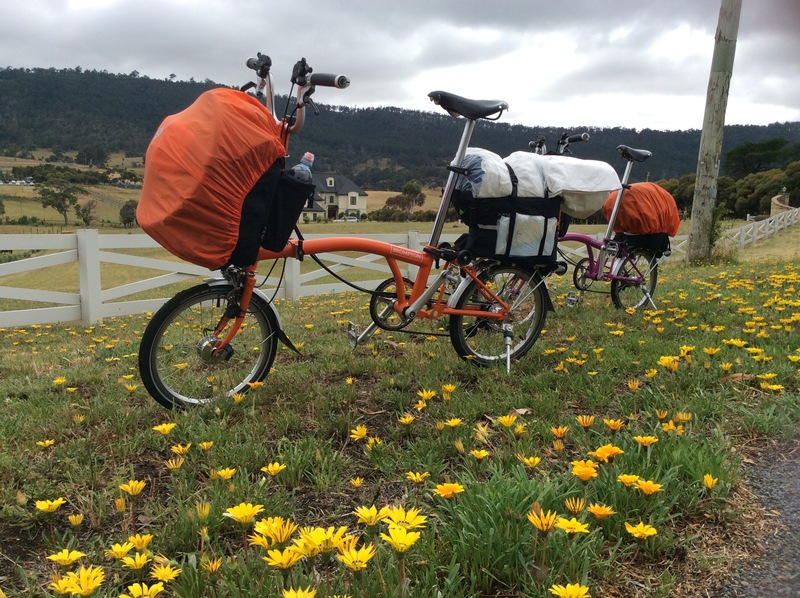 We were already hatching plans to ride the Bromptons up Mount Wellington however, so the riding was not over yet! In case you’re wondering, our blog posts are running behind and we have not yet caught up. Hopefully tomorrow we will be up to date and posting in real time!